American River College’s baseball team fell to 1-3 for the season after a 9-3 loss against Feather River College on Thursday, a game in which ARC’s starting pitcher Andrew Fuentes lasted only ⅓ of an inning, giving up five earned runs before being pulled by head coach Doug Jumelet. Fuentes gave up two walks, two singles, and hit a batter with a pitch before being pulled. His only out came on a sacrifice bunt. Fuentes was replaced by Tommy Balmain, who went on to pitch for 6 ⅔ innings without allowing any runs. Balmain gave up five hits, two walks and struck out five over 83 pitches in relief. ARC couldn’t convert any runs during Balmain’s shutdown though, with only one real opportunity that was negated. With two outs and two ARC base runners aboard, catcher Bryan Babcock on second and shortstop Cameron Bennett on first, outfielder Alex Gaskin hit a deep grounder toward the hole at a shortstop that likely couldn’t have been converted for an out to any base. But while running from second to third, Babcock kicked the ball, and was called with the third out. The ball didn’t bounce very high off the ground, but was just high enough to catch Babcock on the cleat as he tried to jump over it. ARC did manage to score all three of its runs in the bottom of the eighth inning thanks to a two-RBI triple by Kirby Broadbent, and a sacrifice fly by designated hitter Dalton DeVries to bring home Broadbent. In all, 11 ARC batters reached base, but only three of those came from hits. 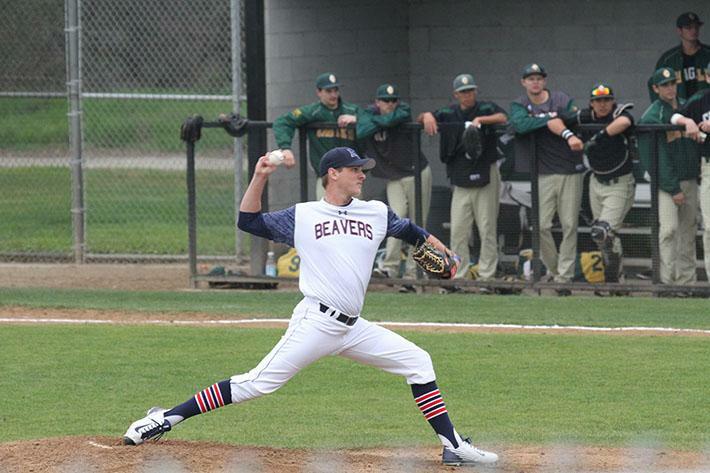 Five different Beavers walked seven total times, and Feather River committed one error, allowing a single. But once Balmain was replaced after his emergency outing, the next two relievers gave up two runs apiece over one total inning pitched to seal the loss. Broadbent, a freshman first baseman and pitcher, continued his hot start to the season, finishing 1-2 with a triple, two walks and two RBIs. Broadbent is hitting for a .615 average, with three doubles, two triples, four RBIs, and five walks. The only other hitter for ARC with over 10 at-bats to average over .300 is sophomore Colton Freeman, who owns a .364 average, along with 3 RBIs and two doubles. Jumelet did not comment on the game and did not make players available for comment. Be the first to comment on "Baseball falls to 1-3 after loss to Feather River"